The Dono&Dono Cotton Cuddle Blanket is so versatile, it acts as a three products in one! Use as an ultra soft swaddle blanket and keep your baby secure and warm, use it as a stroller blanket to help protect from harsh UV rays, or mom can use it as a nursing cover for extra privacy. Made with a luxurious brushed cotton flannel, this multifunctional blanket might just become baby’s favorite security blanket! Made of 100% premium cotton flannel and treated with our safe and all-natural BambooCARE™ processing which inhibits the growth of bacteria. The BambooCARE™ enhancement treatment creates a fabric that is moisture wicking, deodorizing, and blocks out harmful UV rays. It will also resist static electricity, making it ideal for drier winter months. Best of all, it is completely natural and safe for all ages. In the beginning stages of life, an infant’s eyesight is not fully developed and simple high-contrasting images are easy for baby to focus on. Dono&Dono products all feature modern, black and white designs, great for baby’s developing eyesight and proven to boost brain development. Blanket measures 41” x 41”. 100% Cotton with Bamboo processing. Washing instructions: Machine wash cold, gentle cycle. Line dry. Do not bleach. Do not iron. Made in South Korea. 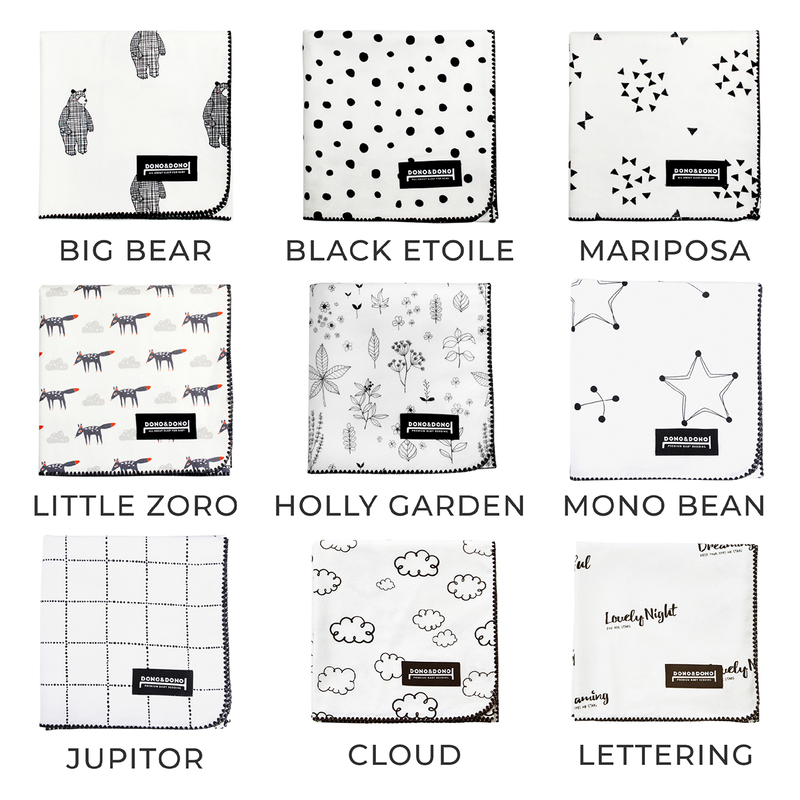 EXCLUSIVE DONO&DONO DESIGNS - Dono&Dono products all feature high-contrasting black and white unisex designs, great for baby’s developing eyesight and is proven to boost brain development. Our Cotton Flannel Blankets make great tummy time mats for infants too! NATURAL BAMBOO PROCESSING - This all natural textile process inhibits the growth of bacteria and odor by wicking away moisture. BambooCare™ even helps block out the suns ultra violet rays, providing further protection to baby's delicate skin. QUALITY FABRICS & MATERIALS - Each one of our Cotton Flannel Blankets are finished with a beautiful black cross stitch around the edge of the blanket. Every beautiful and unique fabric pattern is exclusive to Dono & Dono. this blanket is extremely versatile- I take it with me everywhere. It works perfectly for swaddling, changing, a cover for stroller, etc. Not to mention- it's so cute !